This is a rehersal for the Ancient Instruments ensemble. It really started out as a Recorder class, but then other instruments were added so that it is now comprised of Soprano and Tenor Recorders, hammered dulcimer, bowed psaltery, and somtimes a flute or pennywhistle. Such instruments are of ancient origin similar to instruments that might have been used to accompany the singing of the psalms. Anyone who has an interest in participating in this group is welcome. 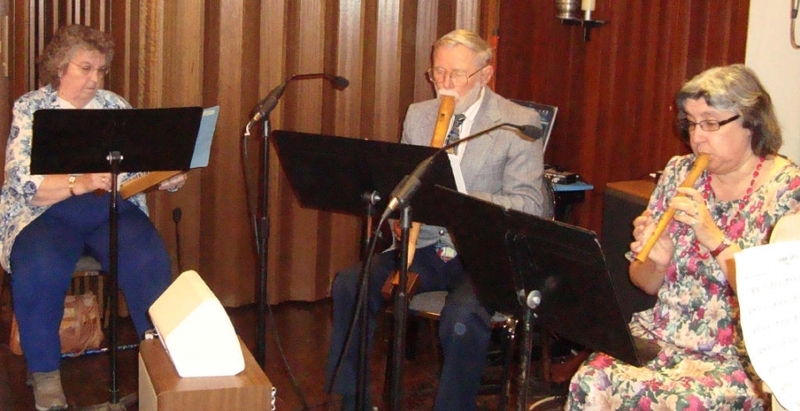 Jo Anne, Duane and Linda are pictured, playing the bowed psaltery, tenor recorder and soprano recorder. Diane is shown here playing the hammered dulcimer.